This is Fabian Nicieza's first work on a Marvel universe title. He'll also be writing next issue. Both are basically fill-ins as we wait for Peter David to get moved here from Spectacular Spider-Man. 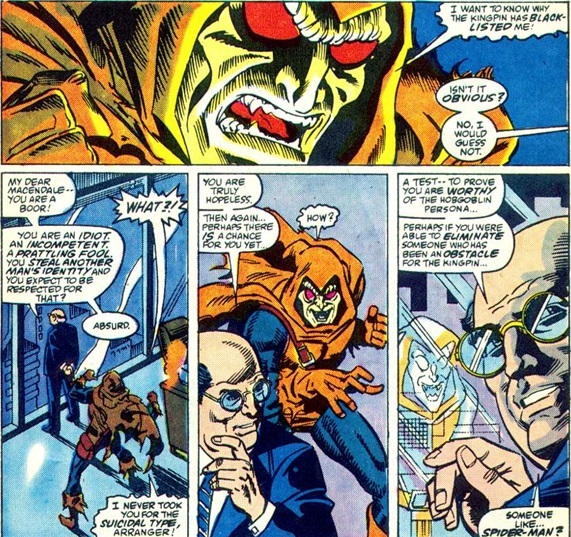 This issue has the Hobgoblin attacking the Kingpin's building because he's been blacklisted as an assassin. 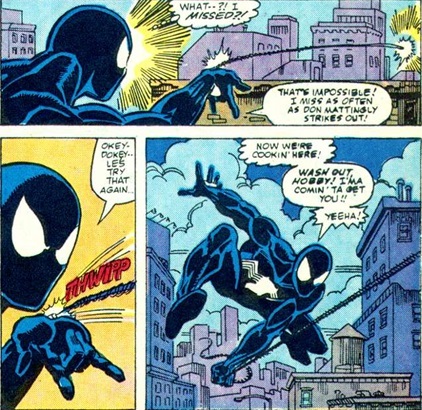 The Arranger tells him that he might remedy the situation if he can kill Spider-Man. He's then shown the door, or window, by the Kingpin's newest hire, Tombstone. Hobgoblin manages to summon his glider, and survives the fall. 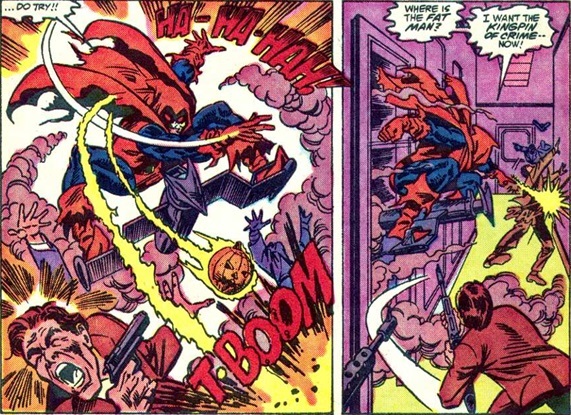 Despite that treatment, the Hobgoblin still decides to go kill Spider-Man, saying that he'll come back and kill the Arranger later. 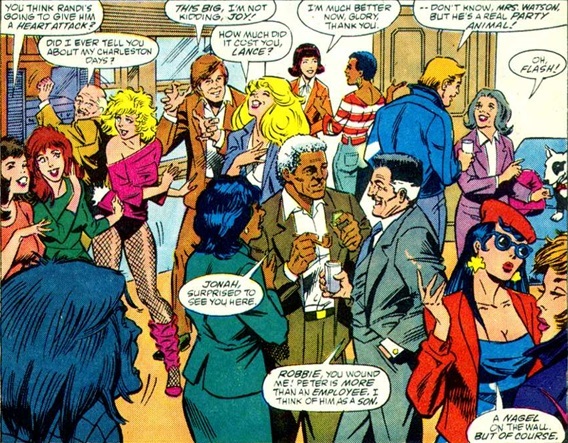 Meanwhile, party at Peter and MJ's place. 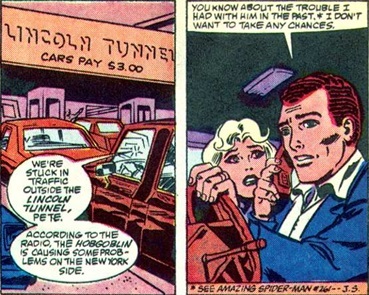 Peter eventually gets a call from Harry, who is stuck in traffic due to the Hobgoblin causing trouble trying to get Spider-Man's attention. I guess Harry's got a car phone? Pretty rare for 1988, right? 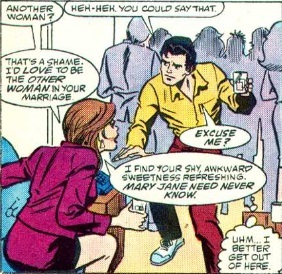 Peter gets Mary Jane to make excuses for him, which she does unhappily, and then he ducks out of the party. He's been hitting MJ's punch pretty hard though, so he's a little drunk. And that of course is a problem during the fight. Luckily, Hobgoblin's glider malfunctions, ending the fight early. When Peter gets back he demands to know who's been spiking the punch, and it turns out to be his landlord Mrs. Muggins' husband. 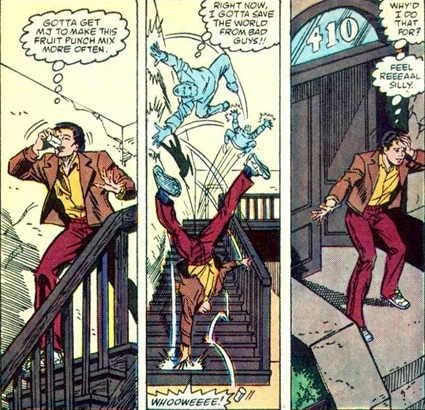 Well you have to admit you never saw Spider-Man fighting while drunk before. A good fill-in issue. Chronological Placement Considerations: Should probably take place after we learn that Tombstone is working for the Kingpin in Spectacular Spider-Man #137, but i suppose it's not a requirement. 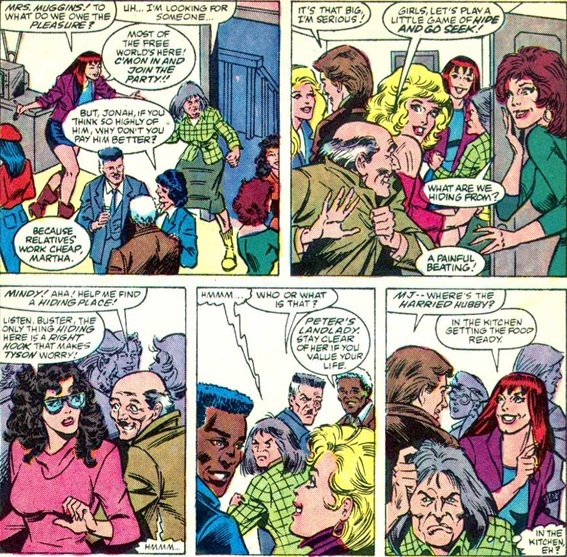 More importantly, since the party takes place in Peter's old apartment and Spidey is wearing his black costume, this has to take place before Amazing Spider-Man #298-300. 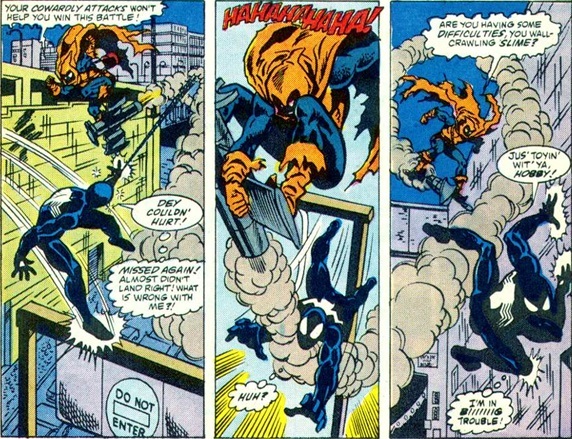 When Jason Macendale thinks back to his past as a mercenary and his "countless defeats", we see an image of his fight with Silver Sable in Amazing Spider-Man #279 while he was still Jack O'Lantern, and the scene of Flash Thompson interfering with his fight with Spider-Man in Amazing Spider-Man #289 after he became the new Hobgoblin. 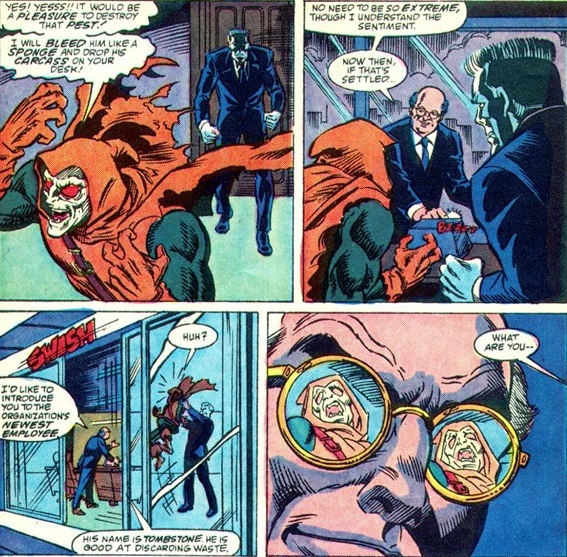 Harry Osborn doesn't know that there's a new Hobgoblin, so he refers to Amazing Spider-Man #261, when Peter had problems with the original. Just to clarify- this is Fabian's first work on a regular Marvel Universe title. He'd been doing Psi-Force before this. This issue helped make the new Hobgoblin look like a total loser- he gets mocked by the Arranger, humiliated by a villain who's Robbie's age and has no powers yet (albeit one in excellent condition for his age), and fails to defeat a drunk Spider-Man. Unfortunately, he never shook this image in the eyes of many fans. 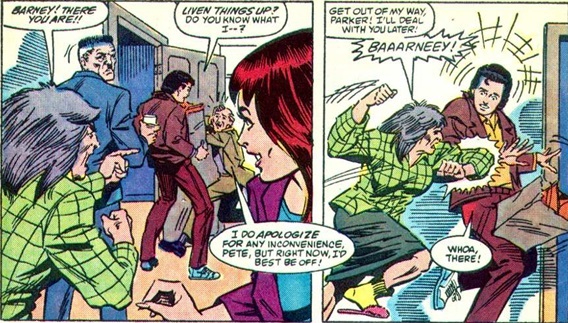 This issue also comes up in debates about the scene in Amazing 612 when Peter passes out after one drink- note that Peter has several drinks of the spiked punch and is still able to fight off the Hobgoblin (with difficulty). Yep, Hobgob looked like a total loser but then he was Jack O, who turned out to be a total loser. Shame as I really liked both characters at one point. To add insult to injury to Hobby, this is the story that was chosen to represent him in the Spider-Man's Greatest Foes TBP! I don't think this issue did much for establishing the MacGoblin as a threat. Beaten by a drunk spidey and sailing off into the sunset on an out of control glider wile e coyote style. 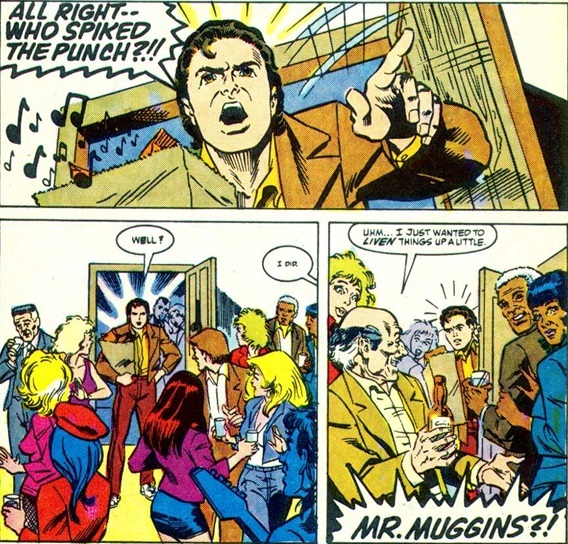 PS is this Mr Muggin's first appearance? Fairly certain it's Mr. Muggin's only appearance.